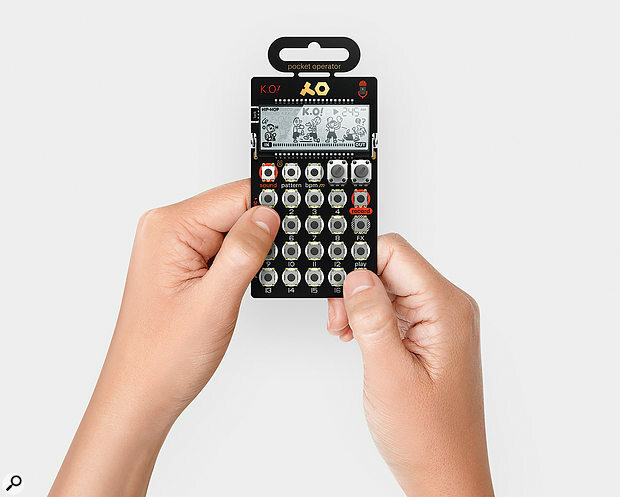 Teenage Engineering’s latest three Pocket Operators push the format into new, more sophisticated territory with drum synthesis and sampling. Back in SOS December 2017 we reviewed the first of this new ‘Metal’ range , the PO-32 Tonic drum synth, which is a hardware condensation of Sonic Charge’s Microtonic VST plug-in. Now we’ve got our hands on the PO-33 KO! 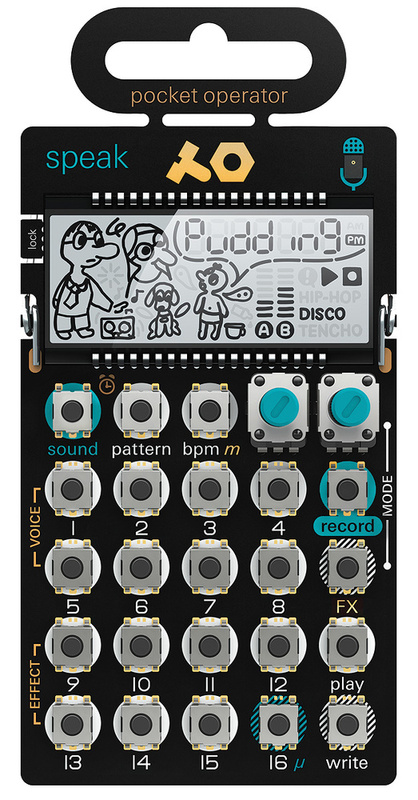 : the first Pocket Operator sampler, offering eight melodic sample voices and eight slice players. 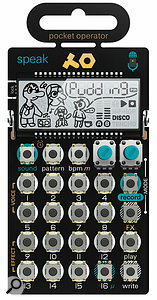 Also in our pockets is the PO-35 Speak, which is also a sampler but specialises in vocal sampling and voice synthesis. Physically, the new POs appear identical to their predecessors, consisting of a phone-sized sliver of PCB with surface-mount screen and button grid on the front, and a battery clip and fold-out stand on the back. All delicate or static-sensitive components are housed safely behind the screen, but if you prefer a more traditional feel you can add the Pro Case, which gives you a rubber shell and button caps. The top hanger section can be snapped off. Two 3.5mm jacks at the top corners provide for sampling input and audio output. The ports can be used for sync’ing multiple PO units or jam sync’ing to a click from another source, using one leg of the stereo connection for audio and the other for sync. Both models also have small (obviously) built-in mics and speakers, which are ideal for independent operation and general mucking about. This point was proven conclusively by the regular disappearance of the POs into my children’s bedrooms, after which I’d find my sound slots filled with YouTube meme phrases and — I’m truly sorry to report — bodily emissions. Like the other POs, much of the screen is taken up with cartoon animations that play along with your patterns, but text and numeric fields around the edges provide useful feedback about modes and parameters. This can be reassuring as many functions are accessed with multi-button combinations that you need to memorise. Basic operation of the PO-33 and PO-35 will be familiar if you’ve used any of the previous models, but otherwise takes a little getting used to. You work with one sound slot at a time, chosen by holding the Sound button and tapping one of the 16 number buttons. You can then either play it freeform using the number buttons as note/slice triggers, or you can step sequence it by entering Write mode and adding triggers within the 16-step sequence using the same buttons. Real-time pattern recording is also possible by holding down the Write button while tapping out notes. Patterns are selected for playback or editing with the dedicated Pattern button, again in combination with one of the 16 main grid buttons. When playing back, Pattern recall takes effect at the end of the 16 steps. You can also queue up a chain of patterns to play back in sequence by pressing several buttons in succession. This is a temporary performance group rather than a full-blown song mode. During playback you can apply momentary effects to the mixed output by holding the FX button and choosing from the FX pool via the grid. This is one of the most brilliant features of the Pocket Operators, giving you tons of real-time performance variation. The KO! has a full complement of 15 effect types while Speak, slightly disappointingly, has seven, as eight of the effects slots on the latter are used for the playback sound engine modes. Rather than traditional audio processors, the performance effects are designed for breaking up patterns with interesting variations and builds. The menu includes things like stutter, reverse, triplet shuffle and slow-down, etc. Let’s look in a little more detail at the two models on test. The KO! offers two different sample capture and playback modes. The first eight sound slots play back a single sample each. Recording is initiated to a slot by holding the Record button and relevant sound button, and you need to keep these held during recording. This is a simple and immediate sampling method (as evidenced by the burps and worse of my progeny), but can be pretty awkward as you can’t use just a thumb. If you need a hand free for generating the sound from another source, you’ll need to put the PO down and hold the buttons with two fingers. There’s a total of 40 seconds of sample time available to share among the 16 slots, and the remaining time counts down on the screen during recording. Audio quality has a bit of a grungy edge with quantisation noise (especially evident on tones); I estimated 12-bit, but it’s apparently only 8-bit at 23.5kHz. Once you have a sample you can offset its pitch with the first knob, effecting a simple speed change rather than stretch. Slots 1-8 can be played back melodically from the buttons. 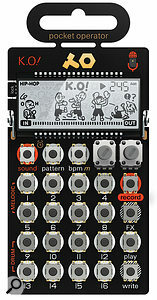 Some Pocket Operators, including the Speak, allow you to set a scale for the buttons, but the KO! doesn’t. Instead there’s a single fixed scale that you can use alongside the master offset. This doesn’t appear to be documented anywhere, but I eventually got the info care of Reddit. From the bottom-left corner the buttons play a minor scale but with both a natural and flat seventh, with the octave two buttons directly up. This allows you play a natural or harmonic minor scale, or a major scale depending on which button you start on. This is a bit restrictive (and the fact that it’s not explained was frustrating) but it’s actually pretty neat for fast and easy melody creation. The two knobs control the current sound and can be cycled through three different parameter sets by tapping the FX button. The main default controls are Pitch and Volume. The second mode controls the sound’s filter. Knob A controls frequency and sweeps between a low-pass to the left of the centre position and high-pass to the right. Knob B controls Resonance. The third mode is Trim, providing simple sample editing capability. A sets the sample start positions, and B is the length. A nice feature is that when moving these controls the sample will trigger repeatedly to provide auditioning. Unfortunately the trim parameters can’t be parameter-locked/automated, or changed during playback, which would have been fun. I would have also loved to have seen a simple A-D envelope to extend the scope of sample manipulation. Sound Slots 9-16 are used for slicing longer samples, so can be used for storing and playing back a set of sounds for non-melodic sequencing, such as drum kits, effects, or even loops if you took the time. Recording is the same: just hold Rec and one of the buttons. If you then play in a series of hits the KO! will automatically chop up the sample and assign slices to the buttons. It does this fairly successfully with short hits, but sounds with longer decays tend to get sliced on to several buttons. Each slice can then be trimmed manually within the overall sample. When you switch to Write mode you can sequence the last played slice, so to create a pattern from multiple slices you need to select one slice at a time, or record in real time. The whole slice group shares a single voice, but the sound slots give you a fast and simple way to create kits and drum parts. Fifteen of Speak’s sound slots work along similar lines to the melodic samples on the KO! : you record a sample in, trim it as necessary and play it back using the buttons like a keyboard. In this case, however, the ‘keys’ can be reallocated to different scales and root notes. More significantly, Speak does not simply play back samples, it re-synthesizes them according to various speech synthesis modes. The results will be recognisable as your original sample for some types of sound like speech, singing or drum loops. Other sounds can get mangled in unpredictable ways! Sonically, Speak is far from a one-trick pony. There are eight voice modes on offer, which can be assigned to each sound independently by holding FX and tapping buttons 1-8. ‘Neutral’ gives you the closest result to your original sample, but is still significantly synthesized. ‘Autotune’ produces the classic pitch-quantising effect, which we should all agree to stop using soon. ‘Retro’ delivers an old-school Hawking-esque voice synthesis. ‘Noise’ gives you a soft spooky noise shaping. ‘Robot’ introduces a harmonic pitched element to any sounds, and ‘Fifth’ is the same with added harmony. ‘Vocoder’ gives you a delicious classic vocoder sound with what sounds like a dirty harmonic carrier and probably 16 filter bands. Finally, ‘Synth’ uses your sample to formant-filter a squarish-sounding synth voice. Speak’s knob modes share some similarities with the KO! but are actually quite different. There are no filters, but this is more than made up for with significantly more sample-manipulation capabilities. On the primary control page, Pitch adjusts the pitch of the sound but doesn’t affect speed. Knob B lets you adjust the formant characteristic independently of pitch. Speak’s Trim function also works differently. Start position is adjusted with knob A, but knob B changes playback speed instead of end position. This gives you a huge range of results from any sample. You can even turn the speed down to zero to freeze the position, then scan the sample with A to find synth tones granular style. Even better, unlike on the KO!, the Trim controls can be used during playback and recorded as automation. But wait, there’s more... The 16th sound slot on Speak holds a major bonus feature. 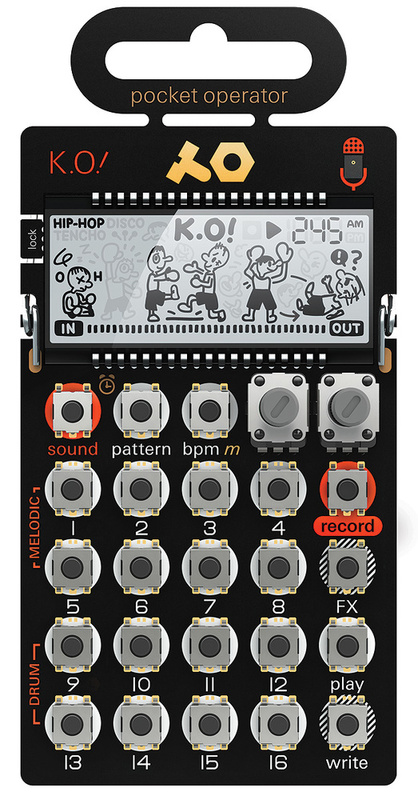 Teenage Engineering have packed in a single voice of the PO-32 Tonic drum synth engine. When sound slot 16 is selected, you get 16 drum sounds laid out across the buttons. The Microtonic drum engine is a genuine drum synth which doesn’t use samples; each sound actually stores two different synth patches that you can morph between using the B button. Speak even inherits the PO-32’s genius ability to load in new drum patches via audio data burst. If you have the Microtonic VST plug-in you can create and save your own drum banks and transfer them to Speak. Speak is great fun, and I found it surprisingly useful. It’s one of those brilliant random factors to have in the studio that you can use to throw something interesting into a track. You can mangle samples into little rhythmic oddities with the parameter automation, or turn anything into a new tone and melody. I used it to add engaging phrases or toplines to a couple of tracks, and each time it took no more than a couple of minutes to do and made a real contribution. On top of that, Speak’s drum voice is the full PO-32 drum engine, with one quarter of its voices, allowing Speak to be used as a stand-alone little beat maker. KO! 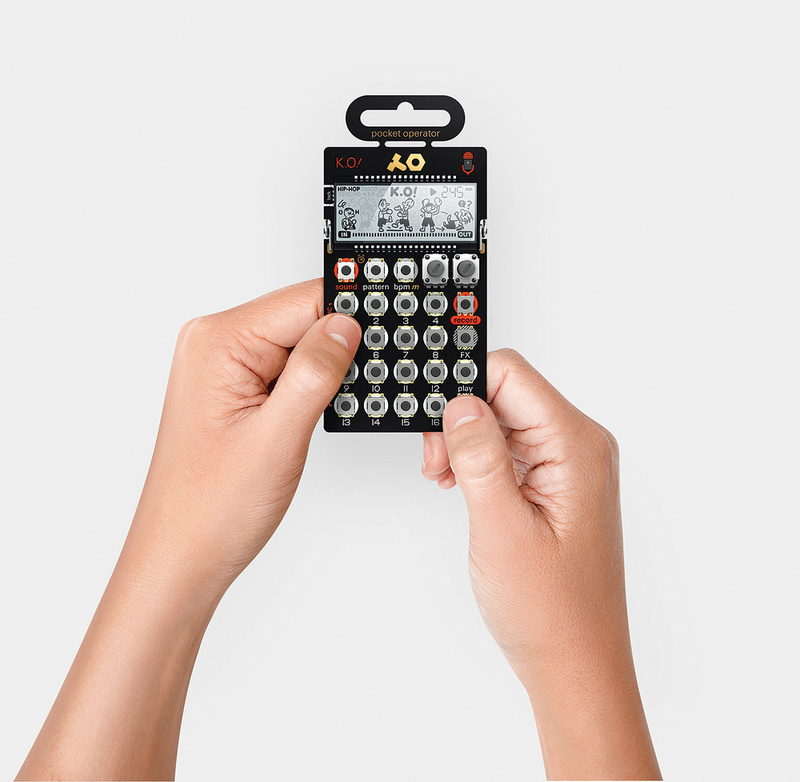 is possibly the most ambitious Pocket Operator yet, a miniaturised performance sampler that actually samples. I bought the case for this one and it’s come everywhere with me since. It’s almost like having a tiny cut-down Digitakt in your pocket, but the limited sampling quality, voice count and lack of envelopes means it’s not likely to replace anyone’s grown-up beatbox. The real secret weapon, though, with all these POs is the performance effects. You might be limited to 16 step patterns, but the effects let you improvise really bonkers and varied beats in a single pass that sound like the result of hours of programming. Korg’s Volca Sample is also battery operated and pocket-sized if you have quite big pockets. It does more but it doesn’t offer direct sampling. The performance effects are so good. KO! has a fixed scale for melodic samples. Need to keep two buttons held down while recording. Audio on the lo-fi side. The first PO samplers are tiny bundles of inspiration in your pocket; great for generating ideas on the go and producing genuinely useful results fast. Po-33 £85, PO-35 £85. Prices include VAT.